Motorcycle manufacturers know that carbon fiber is a great way to create motorcycle parts that are both lightweight and rigid, and lately some brands have developed exotic parts like frames and swingarms made in carbon fiber. The BMW HP4 Race or the Ducati 1299 Superleggera are great examples of that. But now we get news that Honda might be thinking of using this material on their chassis elements, and a set of patents have been filed in America that show how Honda is developing this idea. 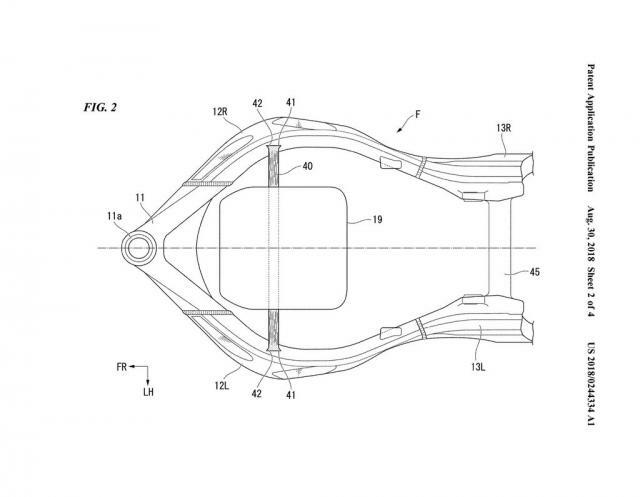 According to what we know from the patent drawings, Honda isn’t thinking about creating a full carbon fiber frame or swingarm, that would be too expensive for mass production, and instead regards the use of this lightweight and strong material as a way to reinforce the frame and swingarm. By reinforcing specific parts of the frame or swingarm with carbon fiber elements, for example a rod connecting both frame rails that goes through the airbox, Honda will be able to adjust and tweak the handling characteristics of the motorcycle according to the intended use, but it can also continue to use the same frames or swingarms already in use in current models. This way the Japanese manufacturer won’t have the need to redefine its entire production line, while effectively making better motorcycles. 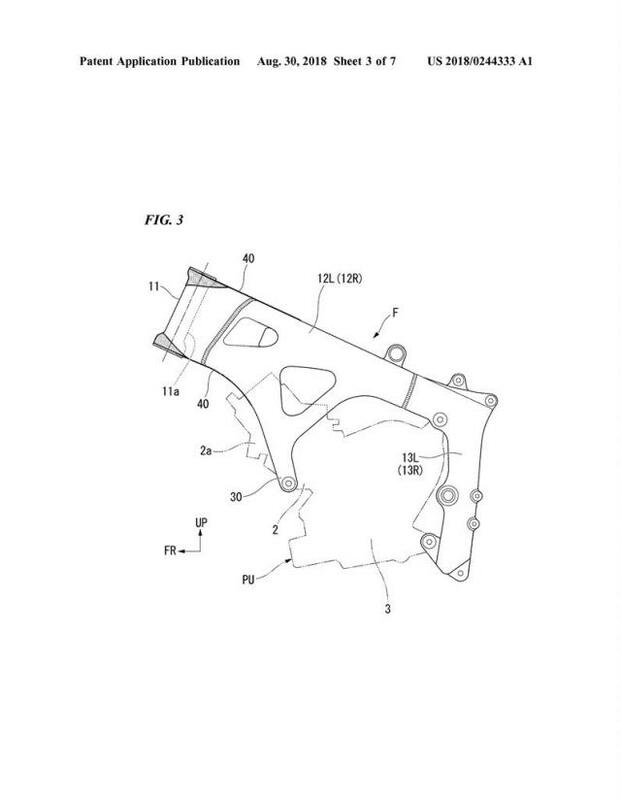 And this is especially interesting, because the motorcycle used by Honda to illustrate this patent application is a CBR600RR. We know Honda decided a few years ago that this supersport machine wouldn’t get any major updates because of lower sales of supersport bikes, but the fact that some brands are still betting on these machines, might make Honda think twice about breathing new life into the CBR600RR. 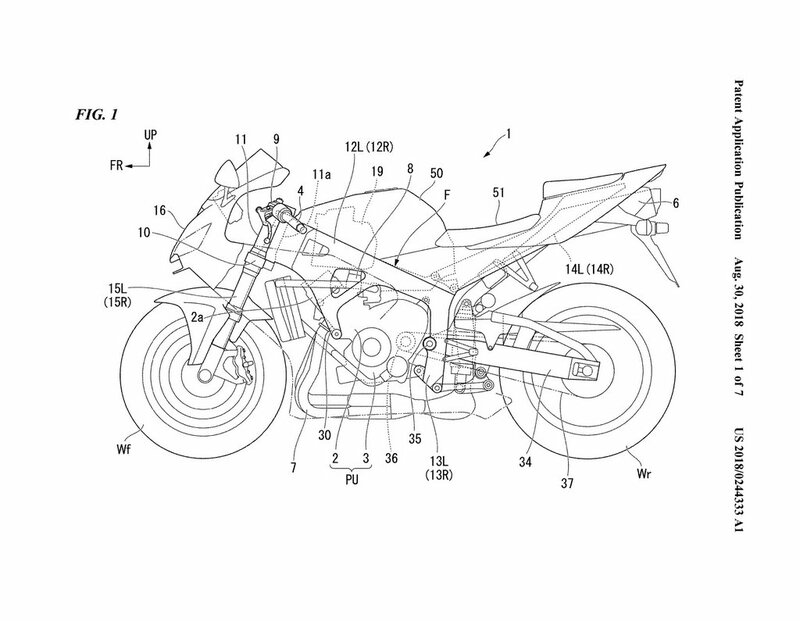 The bike we can see in the patent application is clearly a CBR600RR, but if we look closely, the bike features small differences with the last generation CBR600RR. For example, the front fairing shows a more aggressive central air intake, while the back section also gets slightly different in its bodywork. Will we see a new Honda CBR600RR anytime soon? We don’t think so, at least for the 2019 model year. Probably if Suzuki does launch a new GSX-R600 / 750, and with other brands continuing to evolve their supersport machines, Honda will be interested to show they also know how to build a great supersport bike, but that new bike shouldn’t arrive until 2020. Pingback: Honda: fibra di carbonio per rinforzare i telai? Paton S1-R 60th Anniversary: a bike with racing in mind!